Notes: Super soft and cozy! 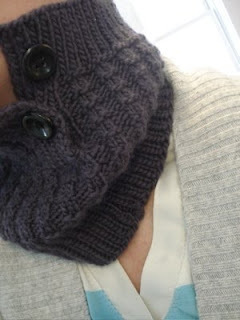 Perfect for cold weather – more like a warm neck gaitor than a decorative cowl. The cushy thermal stitch pattern was so fabulous that I knit up a thermal scarf for Paul for Christmas. We exchanged gifts last night, so I can unveil it! End after completing a Row 1. Bind off knitwise. I'll post modeled photos soon. I picked up the Shepherd's Wool yarn at Stitches Midwest in 2007. It's a great value, especially when you factor in the generous yardage (250 yds), cushy feel, and almost local origin (Michigan). On a side note, I was not a big fan of Stitches, and I don't think I'll return. Even though the vendors were quite nice and there was a wide array of yarn and sundries, convention centers are my idea of hell. I'm sticking to the outdoor fiber festivals as much as possible.